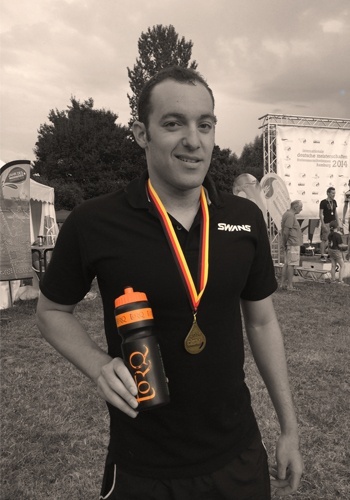 On July 3rd Adam Warner travelled to Hamburg to compete in the Annual International German Open Water National Championships to compete in the 5K and 10K races. This was the third year that I’d competed in this competition, thus I had previously experienced racing against an international field and was also keen to use this race as a “bench mark” to register the progress in my fitness. Day 1 was a travel day, where I made my way from the train, to the airport and then onto my hotel – which to say the least was an experience in itself! Upon arrival, it was a quick double check to ensure I had all my required swim gear and of course my TORQ Nutrition, then it was off to the course to see what it was like and to mentally prep, ready for the race the next day. I arrived at the Lake, the area was packed with spectators and there were many swimmers in the water. Before trying out the course, I signed in, got my race chip and required race cap & then to hit the water for a test lap. 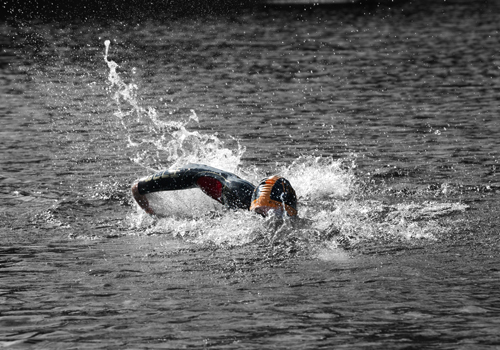 When I was in the water I felt really good, The course felt not too challenging and the buoys were very clear to see. By doing a few laps around the course my confidence grew in readiness for the race the next day. The second day was race day and the 5K (my strongest event). I went to breakfast in the hotel and couldn’t believe the selection of food – only in Germany! Race time had finally arrived and I packed all my TORQ gels, bars and drinks, my SWANS goggles and of course my swimming costume into my Amphibia bag and set off. After I got numbered up, I took a look around at the place and it was heaving with spectators & fellow swimmers – this race was going to be huge! In my sight I could see the variety of international athletes from GB, Germany, Holland and others. The starter told all swimmers to enter the water, It was KAOS and then the siren went off and it was all go, each man for themselves, fighting each other to get to the front. I managed to get myself within the pack with a lot of scratching and kicking, true OW style! It got to about half way in the race and I was still feeling good and strong, then suddenly the stronger swimmers changed gear and pushed it. Unfortunatley I was unable to keep up with the increasing speed, so sadly had to settle for maintaining my pace & continue fighting off the other swimmers. The result was I finished 3rd overall in my Age Group and I was so pleased to win an international Bronze medal, which was a huge achievement for me. I had trained really hard for this race, which I felt enabled me to achieve this great result. It was a really tough one, with all the added contentions of the scratching and punching, but that is the sport of Open Water racing I guess? Onwards and upwards!!!! After my rest day, it was time for the 10k – the big one! I was a bit nervous to be honest, as it was my first 10k of the season and also for two years. I arrived at the venue feeling strong and not too tired from the 5K. I put my costume on & got my TORQ gels ready. Suddenly a German Coach came and asked if I had a feeder for the race? Unfortunately I hadn’t! The coach then kindly offered to help me out, so that I would not have to feed myself, this inturn made me less nervous which was cool. It came to the race start, and after waiting no time at all, the siren went off and the usual washing machine frenzy started. I had a really good start and managed to stay with the pack and the pace felt so much faster than my previous 5k race, but I was prepared to work with it. After the first lap I spotted some competitors feeding, I thought this was a good opportunity to get myself up to the front, which indeed paid off, for a couple laps at least. Unfortunately however, the pace at the 5Km mark had rapidly picked up. This time I was unable to maintain the pace of the main field and gaps started to be created amongst the swimmers. I ended up coming 19th overall, which wasn’t the best position, however to complete the race was the main objective and to see how fast I could go. Overall I was very happy with how I performed in the 10K and gained lots of experience and ideas of tactics to use in the future. I had a great weekend in Germany and was so pleased to come away with one medal, now I have to prepare for my next races which are a 5K in Norwich, 3K in Surrey and a 3K at the British National Open Water Championships.